Nearly a month after Ireland’s premier agricultural show I have at last got round to sifting through the images and reflecting upon this years event. One of the advantages of delay is that impressions which will last are emerging from the background of memories and I have selected six photos which to me represent the high points of three days I spent there and give some explanation as to why. Michael Brogan Tractors and the way to sell machines. If there is one thing that never ceases to amaze me about farm shows it is the total disinterest shown by many dealers in potential customers. Thankfully Michael Brogan is an exception to this rule and his stand was well staffed and attentive. 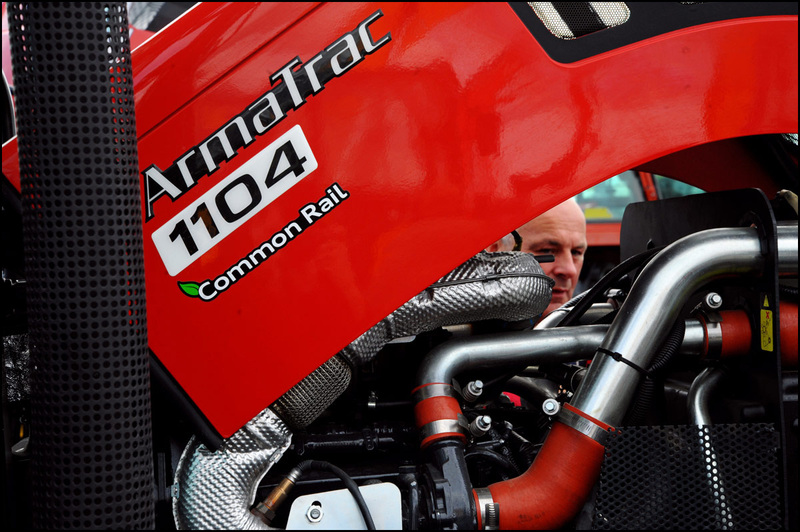 ArmaTrac had even sent over four sales people of their own with the result that at least two ‘sold’ stickers went up on the display tractors and he has since sold more he tells me. Malone Farm Machinery, a favourite shot. Malone’s are one of Ireland’s many smaller innovative company’s and they too are keen to sell their product rather than wait for people to come along and kick the tyres. Such businesses deserve our full support and I hope I did them justice in this photo of their stand. It was used as a header by Farm and Plant Buyers Guide on my report of the show, it’s kinda nice to know that it’s appreciated by others. Farm and Plant Buyers Guide. 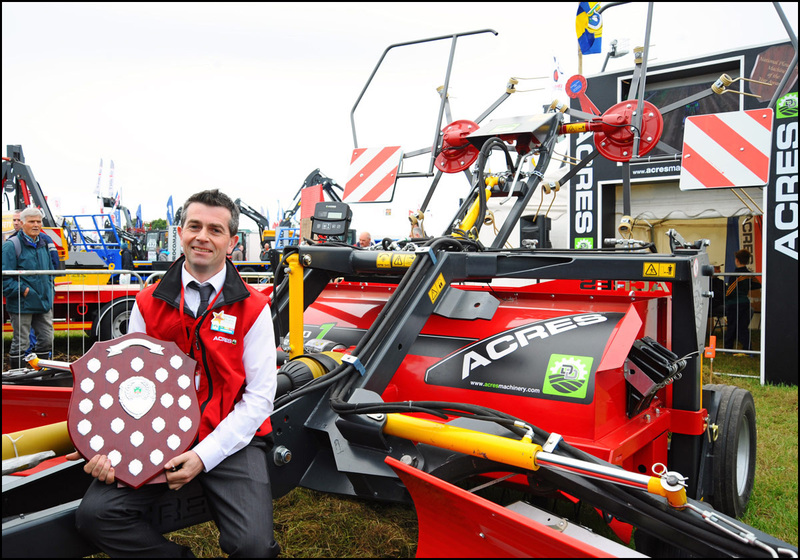 This is David Doran, founder of Acres Machinery and a man on a mission to take Irish Agriculture forward to the front of grass conservation technique. His vision is of full traceability in forage crops, allowing farmers to more accurately match feeding to silage quality and his plans are well formed and forward looking. No surprise then that he was the first winner of the new Machine of the Year Award which he proudly holds here. 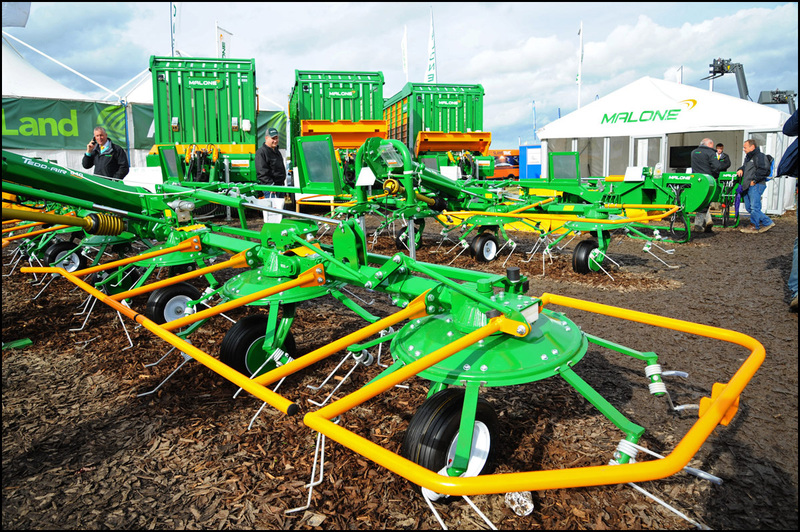 Acres Machinery also features in Farm and Plant Buyers Gide. Zero Grazer and a touch of trumpet blowing. 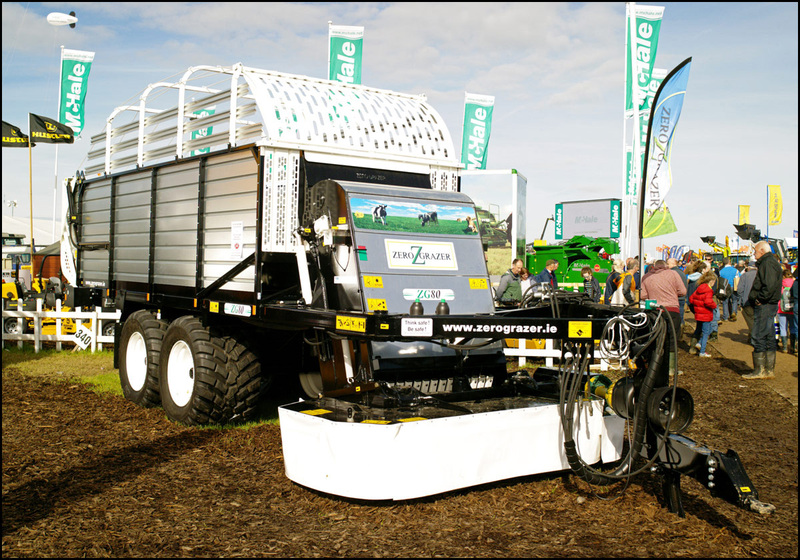 Innovation doesn’t stop with new equipment, constant improvement and invention has led Zero Grazer to develop economical variations of established concepts. This is one of their latest fitted with an efficient disc rather than drum mower, a small point to many but they are the only ones able to make the arrangement work. As for the trumpet blowing then I was delighted how this tricky subject turned out in the photo. Shiny metal, a black chassis and white paintwork was always going to be a difficult proposition, but I think I’ve managed it here. A rare beast with a history attached. 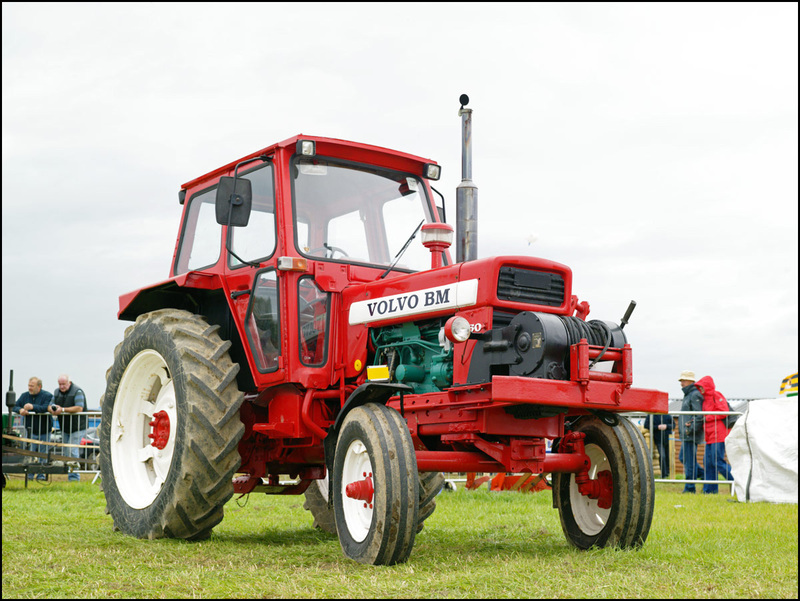 There are very few Volvo BM tractors in Ireland, they were never imported directly and the company transferred the tractor Business to Valmet (now Valtra) in the early 80’s. So what have we here in another shot I’m rather chuffed with? It’s a Volvo 650 which we know left the factory to join the Swedish army in 1974, but when it was demobbed or what happened in between is a puzzle although it’s known to have undergone some attention from a previous owner somewhere along the line, and therein lies a mystery that its owner, Tom Looman, is hoping to solve. A family day out and all for a good cause. 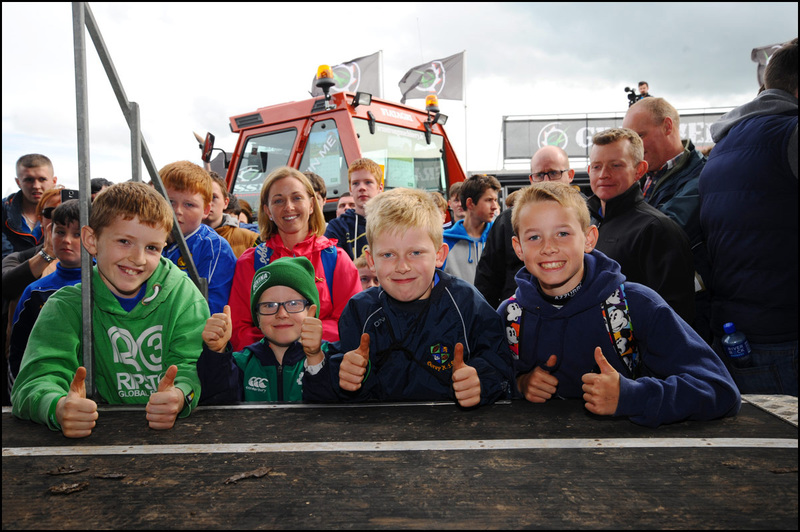 The ploughing itself is still central to the event but it has also become a family day out with many attractions for the younger machine fanatics as well as there long suffering families. Here we have such a group awaiting the draw for refurbished Fiat 90-110 which Grassman Videos were raffling off for charity. They raised €120,000 for the Make a Wish Foundation, a quite incredible result and a great note to end the show on. This entry was posted in Uncategorized on October 15, 2016 by Triplemanr.